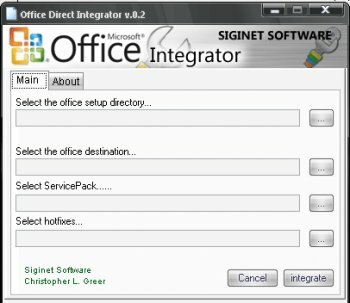 Siginet's Office integrator can easily slipstream Service Packs and Hotfixes for your Microsoft Office Suite. It ensures that every update is properly placed into the registry to make microsoft update happy. All the other slipstreamers for Office have been worthless except to people who can't figure out IExpress and msiexec command-line options. However, this one rocks because benners & Siginet took the time to sort out the registry additions necessary for a slipstreamed installation to look like an incrementally patched one. That's what it takes to prevent automatic updates from trying to re-apply patches which were already slipstreamed. They are still working on getting the registry additions exactly right, but it's looking very good.